Johnakan-Ur-El: It is a pleasure to be at this moment with you, Johnakan-Ur-El is speaking with you, the Thetan of this vessel. And above all things I’ll explain some topics that may or may have been misinterpreted or not fully clarified. It’s always important to express the smallest doubt and don’t keep it... Any doubt corrodes inside; it’s important to try to unveil any question, as long as "the source" that responds that question not only be ideal, but also has knowledge on the subject. Before we start with the questions, I will make a brief comment about the planes of error. We know that the plane 2 is a plane of extreme cruelty; this plane is inhabited by spirits that were embodied, as well as their thetans, or 100% spirits who have committed cruel acts. The spirits of the plane 2 not only are not sorry about their acts, but they even feel falsely proud of them. Many times the act of cruelty is more serious in the spirit than it is in the embodied being, because the incarnated being is limited by his/her mental decoder, and there are spirits who either for convenience or for their low aspiration to grow up, or due to their indifference they simply enjoy, allegedly, the pleasures of the physical plane, therefore, these spirits of error choose to incarnate in a vessel "genetically poor" at conceptual level. These beings who commit atrocities on the physical plane, it’s not that they have an attenuating circumstance due to the lower conceptual level they have, but somehow the level of understanding that these people have while committing hostile acts is often small... Obviously that this does not justify their cruel acts, but in this world, Sun 3, I have perceived at different ages hostile acts which were more than brutal, where people who committed those cruel acts had a complete and utter indifference due to their low understanding, something that does not happen to their spiritual parts or to the 100% spirit, when a person disembodied. Although not all spirits have the same conceptual level, they no longer depend on a brain or mental decoder which is subject to atrophy or it may have less understanding capacity... When I say understanding I refer to "decoding the concept ". There is another plane of error, which is the plane 3, where most of the embodied beings are. The vast majority of the embodied beings dwell in the plane 3. The difference between the plane 3 and the plane 2 is not a situation of lower cruelty than the level 2, although there is cruelty in the end, but in the plane 3 there are spirits with questions. Obviously there are arrogant spirits, conceited spirits that have some slight cruelty, spirits with the aim of a boastful and excessive competition, indifferent spirits, mediocre spirits in the sense of enlighten themselves and others, but there are comfortable spirits, spirits who have a tremendous capacity of understanding in the plane 3, and sometimes they have even served in the planes 4 and 5, obviously, but they are not interested in such responsibility, they don’t feel comfortable with that responsibility. Interlocutor: They do not take a commitment? Johnakan-Ur-El: They are not comfortable with commitment and since they don’t feel comfortable with commitment; they stay in the plane 3. I know that many spirits or Thetans in this case, who are in the plane 3. Sublevel 9, and many times due to their own merit, because I've said many years ago that "there is no reward, or punishment, only a consequence of our own actions," sometimes due to a merit there is the consequence that a spirit ascends to the plane 4.1, but the same spirit is clouded with hostile thoughts, because the spirit doesn’t want to ascend of plane. The fact of being obfuscated obviously implies ego, and the ego is “heavy" and so the spirit does not ascend of plane. I conceptualized telepathically with more than one entity from the plane 3, and they have confessed they feel conveniently comfortable of being in that situation, without any responsibility, There are even spirits who do want to be helpful, sending messages to the causal bodies of incarnated beings, guidance, but as you would say in the physical plane: "Do not talk to them about commitment" no, They are not interested on commitment. Johnakan-Ur-El: Of course that their time will come…It’s very important to address that, because in the plane 3 there is a huge variety of spirits of different vibrations, with different trends, spirits that live with guilt complexes, with regrets, conceited spirits, arrogant spirits, with low self-esteem... Spirits that have a tremendous attachment to the physical plane, spirits that have physical appetites. Obviously, as I always said, those appetites are conceptual because the spirit has no body, and the fact of not having a vibrating matter in the plane 1, and not being able to satisfy any physical need, since they are not in the physical plane directly, makes that they have a tremendous conceptual attachment. Many times that spiritual attachment makes them act by “making focus of energy" and try, in a self-convincing way- that they can overcome those physical appetites, whether an appetite for food, a sexual appetite, or an appetite for nicotine... And obviously the frustration of those spirits is so great because they are not satisfied, and these spirits feel frustrated and they may even lower of sublevel and even of plane because resentment is one of the worst emotions, holding grudges always points a finger at others, resentment always dictates that the others are guilty, resentment always points at the "other" as a responsible for the failure of the entity itself. The same thing happens in the physical plane, exactly the same thing, because it’s easier for some people who failed to make a commitment to point at other people as responsible for their own failure. Interlocutor: Maybe from the plane we are, we all should delve a little into knowledge in order to reach understanding, and once we have comprehension, we may make a commitment, and perhaps the commitment achieved at human level can make that many of these spirits can change that trend towards commitment. Johnakan, I don’t know if we can start with some questions. 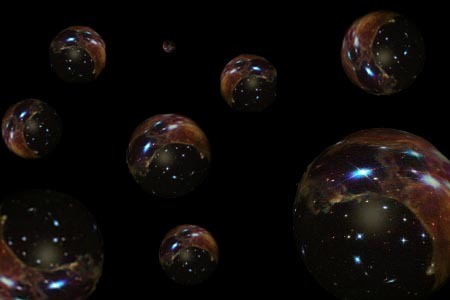 Interlocutor: In one of the sessions Abba referred to the universes as spheres, and some of those universes touch each other. So I imagined something like spheres that touch each other, as though there is an intersection among them. Then, in that intersection, I presume that these universes share something. Is there something in common with those universes that share that intersection? Interlocutor: Yes, I remember that. Johnakan-Ur-El: We approached to the Chaos, to which the angelic entity Kar-El had approached previously, guided by the hand of Eon, figuratively speaking, and I have not perceived another universe closer... I did perceive an overwhelming Nothingness, overwhelming with a “giant” conceptual silence... For instance, so that you understand me, If you are in a city, a noisy metropolis and you listen to the claxons, people talking etc... And suddenly you are immersed into a sound-proof room and you feel then that there is total stillness, a total silence, and your physical ears listen something like "Silence" as a kind of hissing sound of silence. In the spiritual planes there is no sound, not like the sound you perceive in the physical plane, but there is a conceptual sound, which is something very difficult to explain to an embodied person... In this "Nothingness" there is no conceptual sound, there is nothing, then, one "tunes carefully" the conceptual senses, paying attention with the conceptual hearing, the conceptual antennae on the edge of the universe, and it's like that one listens to the silence in that “Nothingness." However, the times I have contacted conceptually with the "Father," to whom I call Eon, He has told me that there are universes that touch each other or universes that are intercepted in some parts with each other, not existing "Nothingness" in between of one universe and the other, and a spirit, in the way I conceptualized from Eon, cannot go to that other universe. I'm not talking about a physical space ship; I'm talking about a spirit... A spirit cannot pass to another universe because it would need to be adapted... It's as if you were a deep-sea diver and you went down into the depths of the sea, and you would be adjusting to a higher pressure than the sea level pressure, in this case we are not talking of pressure, we are talking about a different vibration. Interlocutor: Yes, I was thinking about that. Johnakan-Ur-El: Because it’s another Creation, it’s another Eon the one who vibrates and perhaps our superenergy body, understand that the word "body" is referred to our superluminous energy, which is not adapted to another vibration, and it would be impossible to pass through, or maybe we wouldn’t bear it. I speak humbly, from the little I could grasp from the concept of Eon... I understand, because I just speak from my role as a spirit; that perhaps an Eloah, an Essence, or the Divine Energies may have the capacity to be adapted and to pass to another Creation... Anyways, and surely this is being dictated by Eon, they would be isolated, in the case they could pass through to another universe with a kind of "protective dome" as though they were astronauts with space suits in the outer space, with no atmosphere, and we all, Spirits, Angels, Essences, Elohim, Aes, the same ludic energies that little we said about... we are the manifestation of the Father, Eon, we are Eon’s manifestation, we are part of Him... we cannot get out of him because we are part of Him! Interlocutor: Okay, the vibration is the key. The vibration makes that there is no interference between one universe and the other. Johnakan-Ur-El: However, and I will give a physical example, science in this world, Sun 3, has advanced and they make organ transplants, heart, liver, pancreas, whatever , right? ... There are bodies that reject the new organ because the body, even being so smart, thinks that the strange organ is an invader and it fights against that organ, and a transplant rejection takes place, right? Johnakan-Ur-El: Well, overcoming distances, and do not take this literally... if we had the ability to be adapted; that other Creation could create a kind of rejection, because we are strange "organs" from another body , another Eon. Do you understand this example? Interlocutor: Well... Let’s suppose that this is the universe 1, and I’m here, In the universe 2 another being like me might or might not exist, and so up until the parallel universe 22... if those other parallel-selves of myself are animated by different spirits. What is the connection among the many parallel-selves (doppelgangers) in those universes? For example, I don’t know, let’s say the universe number 3, if there are other parallel universes, and there are other people similar to me, but they are completely dissimilar to me. As well as all the planets have to be almost spherical and flattened at the poles, the more the planet rotates, the more flattened it will be, as in this planetary system Jupiter is an example, the same thing happens to galaxies that have spiral arms, or they may have the shape of a pebble, but they all must always have a logical shape in accordance with the laws of the universe, due to an equilibrium. I consider that the parallel universes, what they do, is to make an equilibrium among the universes of the creation, and for those who live in each universe; that universe will be the number 1, and the others worlds will not even exist for them, because let’s keep in mind that when we are speaking about parallel universes, we're talking about of billions of galaxies in each parallel universe, thousands and millions of galaxies in each parallel universe. So look at it, and I try that the mental decoder of this vessel explain it in an understandable way, How the "spider’s web is woven" so that there is connection among millions of worlds in each galaxy, and millions of galaxies in each universe, so that a certain person in a tiny planet in a solar system, in a certain arm of the galaxy can pass through a small vortex and switch with another person in a mirror effect. Interlocutor: Sure, I asked Jorge just a few days ago about these vortexes, whether or not these vortexes are static, if they are motionless and if it’s possible to detect them because an involuntary pass may happen, moving from one parallel universe to another... well, so that they can cause that people come back or not, then, it is a fundamental issue the one related to the energy vortex. Johnakan-Ur-El: At least on Sun 3 there is not a device capable to detect energy vortexes. My vessel, a short time ago, talked to a friend about the topic taking the example of a tester, an electrical measuring instrument, which could measure, according to the electrical resistance of each copper wire the Ohm, the voltage or volt, the unit you call ampere... If you multiply the electric current Ampere and the volts you get watts or power, then, there are devices that measure these units and there are devices that measure radioactivity, but the energy vortexes have an undetectable energy for a terrestrial device today. In addition, there are very few vortexes that are stable, a large majority of them are unstable and not static, not only can they rotate or move, but they can be closed directly. Interlocutor: So, Is everything completely random? Interlocutor: Oh, yes of course. Johnakan-Ur-El: However, I do know - due to the communication with other Thetans from other worlds- that they experiment with sophisticated equipment, which allows them to get in touch with other parallel universes, and in that way they are also contacted, and this is beautiful in the sense that I admire the technology on the physical plane when they contact with alternate universes. We have already talked about many years ago, in more than one session that there are parallel universes, on Sun 3, where Neanderthal beings are the dominant race on the planet, and there are also alternate universes inhabited by Neanderthal beings. So, it’s not that you would have another parallel-you necessarily in the other 21 parallel universes... You might pass by accident, chance, causality, coincidence, or whatever you want to call it through an energy vortex and you would find yourself in a world with a completely different civilization, not necessarily has to be the almost similar to the world you are living in. Interlocutor: Okay, I understood. I don’t know if we can approach a little more about Eon’s 90% which is not manifested. We know that it can be the energy that would animate people at a spiritual level in other universes... There are some things we know, but I don’t know if there could be more information that our minds could understand. Johnakan-Ur-El: Sometimes we- and I include myself not as the vessel, but as the 90% or Thetan- believe that we have a tremendous knowledge and the more information we grasp, we realize how much we still need to know. I say this because many embodied beings while reading the sessions and hearing from Abba, they can “gaze” at Eon, like saying, Oh! In the end Eon was not the Total Absolute! However, most of you have no idea of how immeasurable Eon is. If only Eon’s 10% has created this manifested universe, and when I say this universe, I speak of the 22 parallel universes, alternate universes, superphysical universes, with the billions of galaxies that only this universe has, and that each galaxy can have around one hundred thousand and three hundred thousand light years across! And each galaxy might have millions of inhabited worlds! Galaxies much larger than the Milky Way, Eon is absolutely immeasurable! , and all you can perceive and whatever you may have knowledge about is part of The Father! Interlocutor: Yes, I feel that the dose of knowledge that all the Entities are giving to us is what we are able to understand. Johnakan-Ur-El: I admire the great capacity of intuition, perception and channeling that my Master “Jeshua," Jesus, had when he was crucified, He elevated his thought and he communicated directly with the “Absolute of all the universes”, with Abba, without having the knowledge that my vessel or any of you can have. That's wonderful! With so little knowledge he had about the superphysical world in that time, He achieved that communication. He had contact directly with the Absolute of all the universes... with Abba! Interlocutor: Well, Johnakan, I don’t know if you have something more to say before we conclude this session. Johnakan-Ur-El: Yes, I’ll simply say that each being in the physical plane must keep exercising his/her mind, however, the best way to exercise the mind is not with tests or exams, but by keeping the mental decoder young, and one of the ways to keep the decoder young, as this vessel always says, is to learn to laugh at yourselves! There is a total detachment from ego when everyone of you learn to laugh at yourselves! And no offense touches you; that everything bounces off... That one really feels sorry or compassionate for real pain, not for silliness, but for real things and for what really matters... Learning to say “no” when it’s necessary, and learning how to stretch out your hand to help others, and I have said it on countless occasions, we must be strong first to help others. Having said that I send all my Light, the light of my Master and the Father's Light, violet, white gold and blue, thanks! Interlocutor: Thank you, Johnakan, and thanks to all the Entities that have supported this session, thank you very much! This entry was posted at Wednesday, July 20, 2011 and is filed under Paradigms . You can follow any responses to this entry through the .